About a month ago my wife Carmen, stepson Lucas, and I went to visit my dear mother-in-law in Northern Minnesota. She lives on a lake and when ever we go up there we have to try our good fortunes out on the lake fishing. So we took the boat out on a somewhat very windy day and since she is familiar with the best fishing spots we dropped anchors in what promised to be a grand location. Well it didn’t take very long until I realized that we were drifting rather quickly into the nearby weed bed. So we pulled up anchor, found them to be clean of any mud or weeds so we motored our way back to our original area, dropped anchors again but this time we stood firm. When were ready to move we pulled up the anchors, this time it was much harder to bring them up, and we found the anchors this time covered with mud and weeds from the lake floor. God then started to talk to me shortly after about this and I found the scripture in Hebrews 6:19, “Which hope we have as an anchor of the soul, both sure and stedfast, and which entereth into that within the veil;” Jesus Christ needs to be our anchor for He is both “sure and steadfast” but unfortunately many a Christian does not see the importance of having and being able to use their anchor to be able to withstand the even lightest of winds. Many just put there anchor in the bow of the boat, where it gets lost over a period of time so when the wind comes they find themselves bashed against the weeds or worse the rocks of this world. We can compare this to the word of God, 2 Timothy 3:16, “All scripture is given by inspiration of God, and is profitable for doctrine, for reproof, for correction, for instruction in righteousness:” Jesus also told us that we cannot live by bread alone but by every word that proceedeth from the mouth of God. Too many believers are being led astray by the many false prophets of our day, we need to read and study His word just not on Sundays but throughout our week, Amen! Depending on the size of your boat you also need to have the proper anchor, if it’s to small, it really becomes as no use, and once again find yourself being blown of course. We need to have a daily prayer life with our Lord and Savior to allow our faith to be large enough when the winds become stronger. We then need to have the anchor secure enough for it to withstand in times that the enemy is putting everything it can to push us away from the love of Jesus Christ in our lives. We need to put on the full armor of God as mentioned in Ephesians 6:10-18 to allow us to do this. Its becoming more apparent that this world is becoming increasingly against the true message of salvation and living fully for the King of Kings and Lord of Lords. 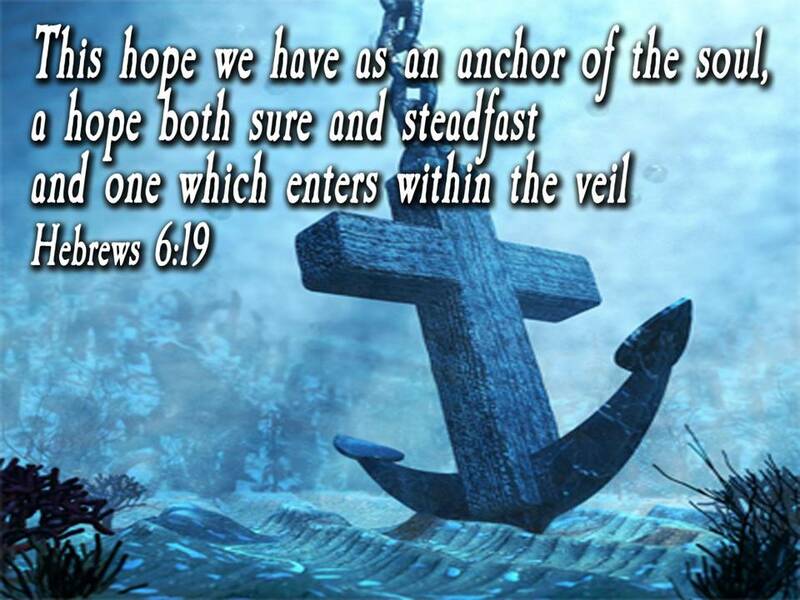 We need to have our anchor sure and steadfast in Jesus Christ in order to be able to withstand the wiles of the devil, so let Jesus become the anchor of your soul! Who Jesus is, thins the crowd!